It is worth noting that the app is simply the newest among other forms of communication. We still enjoy phone conversation and postal mail, and we continue to utilize the marquee in the circle drive, School Messenger calling system, email messaging, Facebook, Twitter, and in-person visits to the elementary and high school offices. An advantage to the website and mobile app is that multiple platforms can be updated simultaneously. This article is intended to introduce to patrons the features of the West Side website and app. The website and app design are intentionally similar so that locating information will be the same on both platforms. The dark green Eagle logo readily identifies West Side School District. 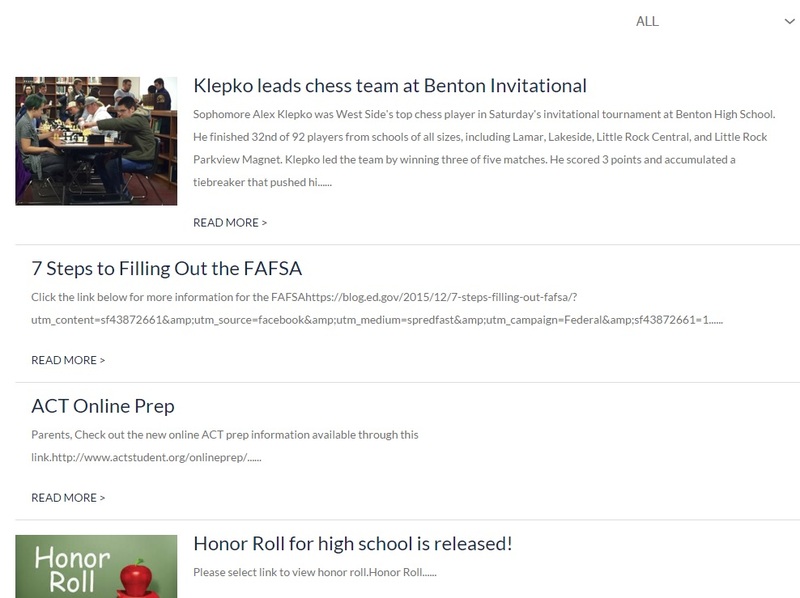 The menu options — Live Feed, News, Events, Athletics, Staff, Dining, Settings, and Documents — give logical descriptions for various types of information. To view the Menu sections, simply click or tap the word “Menu.” On the app, you can also right-swipe the opening page. On the website, users can quickly access the latest Live Feed, News, and Events by looking below the photo splash. Those three sections are aligned in columns with the most recent posts at the top. By clicking “See All,” the entire list of items is shown for the section. To narrow the results of the section, users can filter the results to Elementary School or High School. The mobile app is available at The App Store for Apple devices and at Google Play for Android devices. Search for "West Side AR" and look for the district logo. WEBSITE: The district web page with expandable menu in top right corner. WEBSITE; The News section . . .